When Erik Brust was a teenager, he dreamt about starting a company that made frozen treats that were not only creamy and delicious, but also nutritious and wholesome. 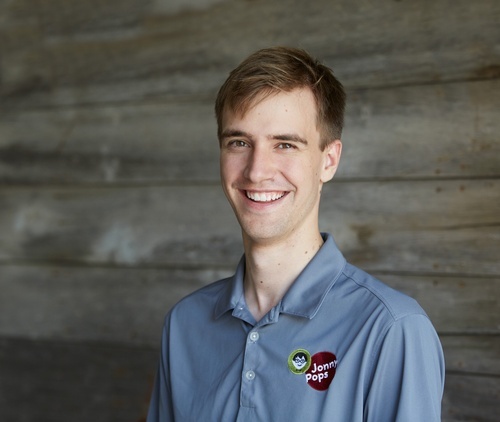 Graduated with an Economics + Statistics degree from St. Olaf College in 2014, Erik is now the Chief Executive Officer of his own frozen "smoothie-on-a-stick" company, JonnyPops, and manages 50+ employees in the marketing, sales, operations and production departments. A strong and fearless leader, Erik is always looking out for the company's best interests. From challenging, innovating, and improving the ways JonnyPops conducts business to injecting the office with culture and celebrations of any magnitude, Erik has been instrumental in the success of the company. Making delicious frozen pops is our passion, and our delightfully creamy smoothie-on-a-stick is the perfect taste-good, feel-good treat. Made with simple ingredients and nothing artificial, JonnyPops are truly scrumptious and meant to be shared. Each stick is printed with a good deed because we believe sharing kindness, through actions big and small, helps us achieve our mission of making the world a better place, one pop at a time.